Can't Beet Them - 16 x 12" oil on Canvas. This is the second in a series of vegetable portraits that I've started since arriving in the Galway (Ireland) area. The series was inspired by a wonderful oilcloth I bought here, and Ireland’s beautiful vegetables. 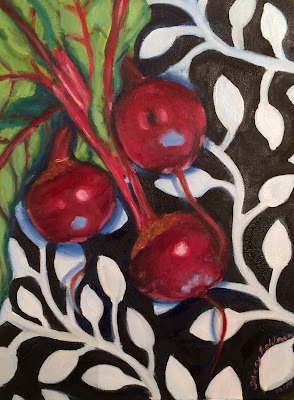 I adore the oilcloth's graphic quality contrasted against the natural shapes and intense hues of the beets. Galway has a thriving farmer's market, and a number of Fruit and Vegetable shops in the area at which I can buy beautiful, fresh veg (as they say here) that still have their greens attached to them. Including them reminds me that they come from the earth - which I love. Hope you enjoy! I haven't figured out how to sell these pieces on-line yet -- because I don't know how to handle the shipping, etc. from here. But, I'm working on trying to put together a show here, and if I still have them when I return home, I'm going to ship them home in a bike box. Then, I'll make them available for sale. Note: to return my home page.